November 17, 2016 8 Comments This post may contain affiliate links. Today I am sharing a project I’ve wanted to do for a while. 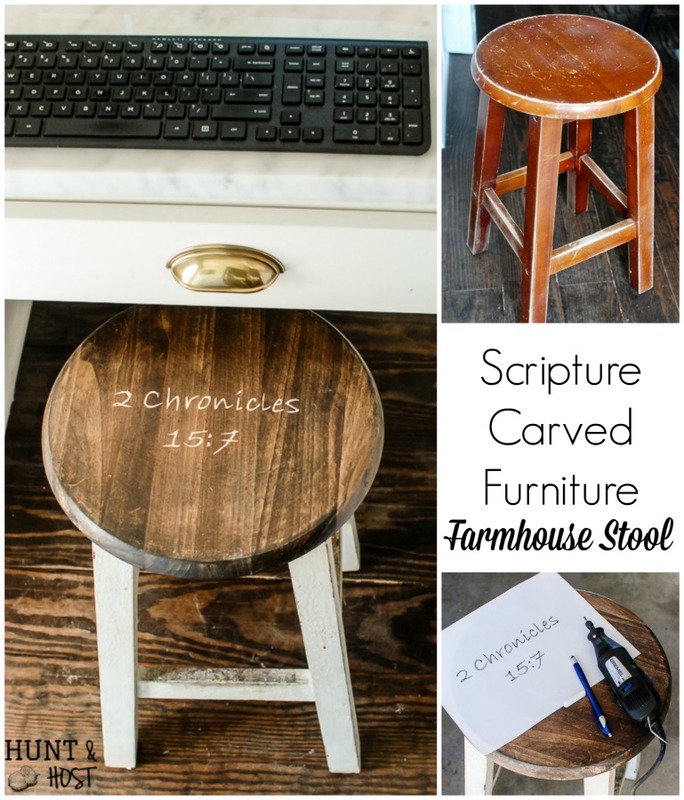 I’m going to show you how to carve a bible verse into furniture. My friend did it a few years back on a project and I have been in love with the idea ever since! If I would have know how easy it was I would have done it much sooner! The stool I used today got a makeover a few months back for this same group and I use it EVERY DAY as my desk chair. 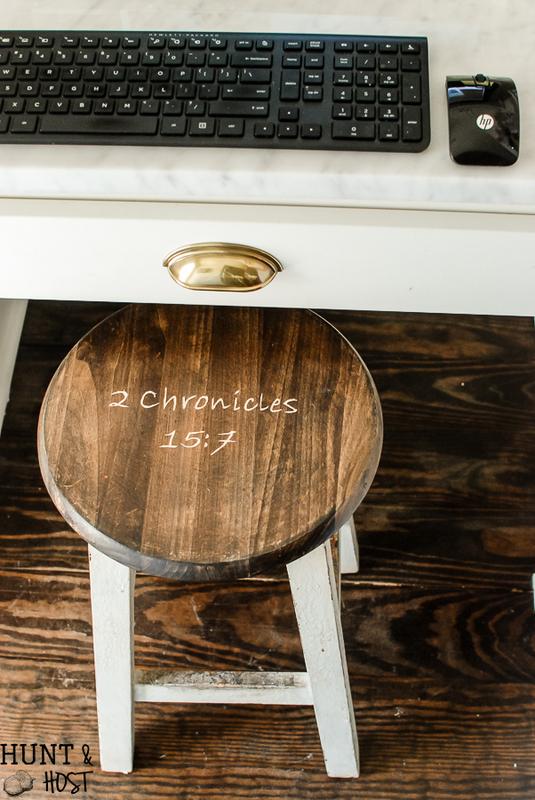 I decided to carve 2 Chronicles 15:7 into this stool so I would have a constant source of encouragement when I sit down to work each day. 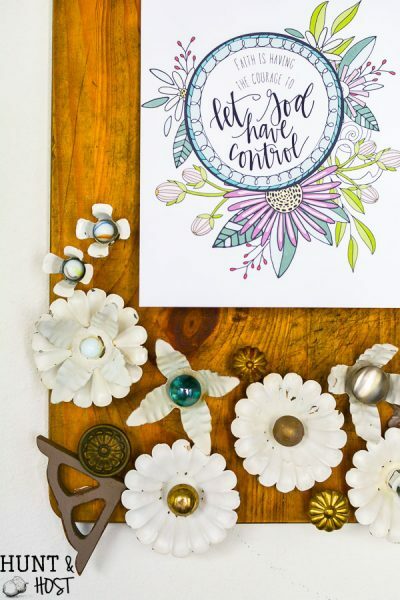 Maybe you could use a daily dose of encouragement too? If so, seek out an applicable scripture and carve it into your desk chair or maybe a picture frame. Now every time I sit I will remember to stay strong and work hard! Here are the steps to achieve the look. Type and print the scripture or verbage you would like to carve. Be selective and think about how intricate your carving will be when selecting fonts. 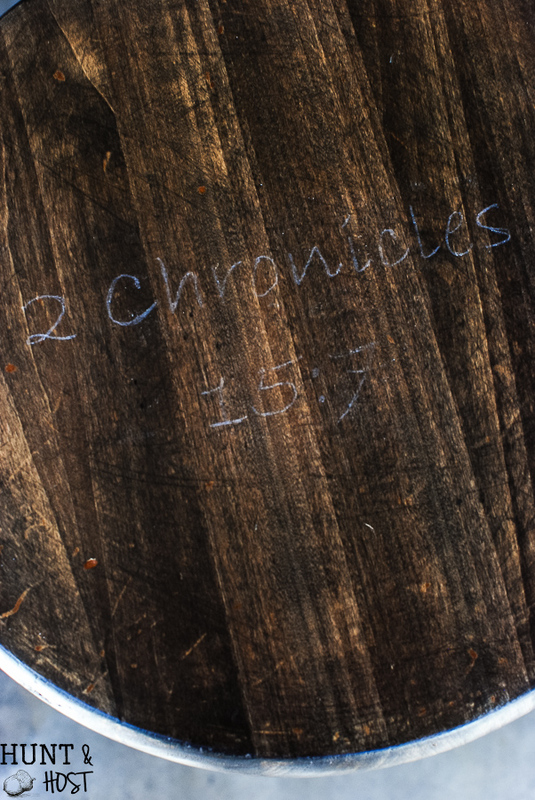 If you are using chalk (instead of trace paper) rub the back side of your printed words. Be sure to center your words on whatever you are carving into. 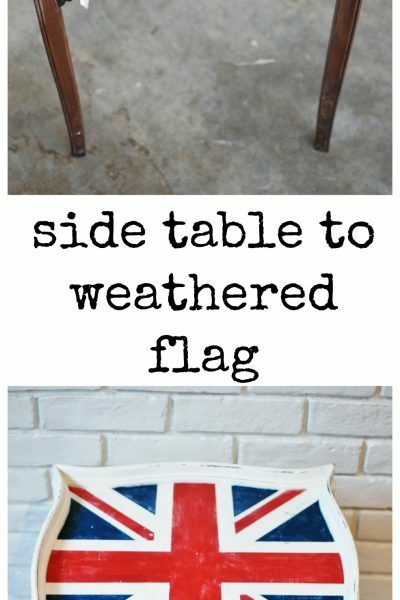 Trace the words with enough pressure to make the chalk rub onto the furniture. 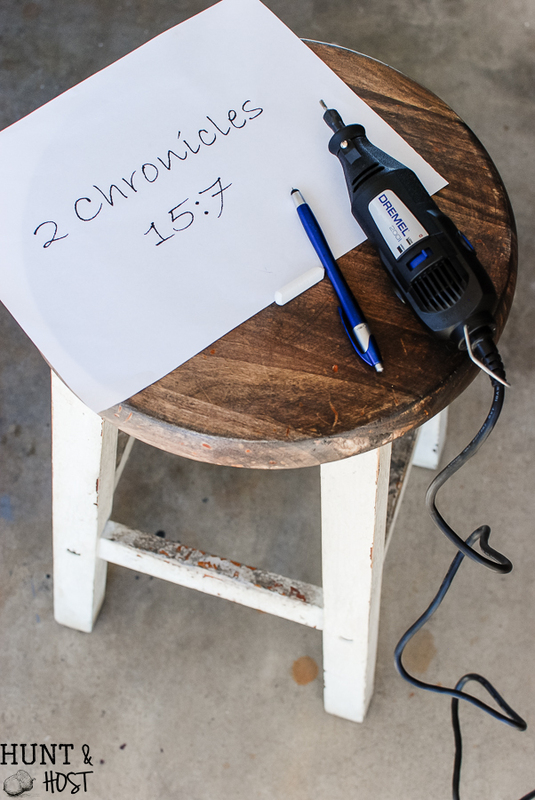 Using your Dremel with a carving tool attachment gently trace over your words. 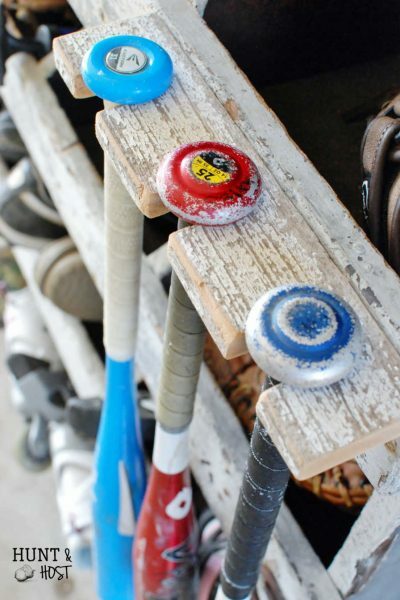 You might want to practice on some scrap wood until you get the feel of carving. You will hold the Dremel like a pen. Many of the areas will take multiple passes using various amounts of pressure to get the lettering just right. You could paint or stain the freshly carved words. I left mine alone because I liked the contrast in the wood. 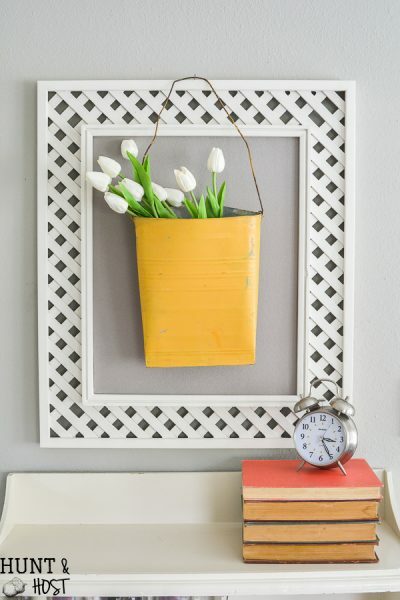 Don’t forget to pin this project for later! Thanks friends! Thank you. I needed this reminder today, and besides, the project is great. The verse is mine today! I opened your email this morning and you said you had already prayed for me. Thank you so much! In return I prayed for you and yours. God is so good to come to us through the love of others!! I love your verse. 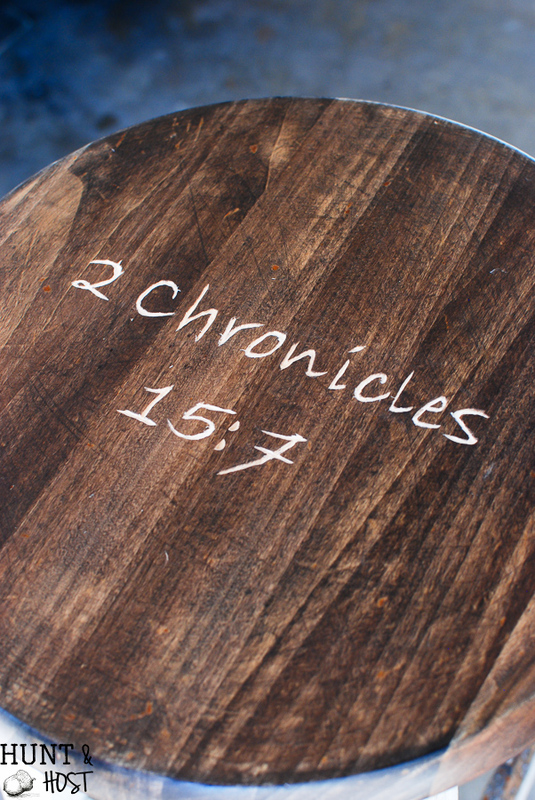 I never think of carving a bible verse in the furniture. I think I will give it a try. Thanks for sharing the meaningful project. Great instructions on how to carve. Thank you Kim. This is the first time I read your blog. 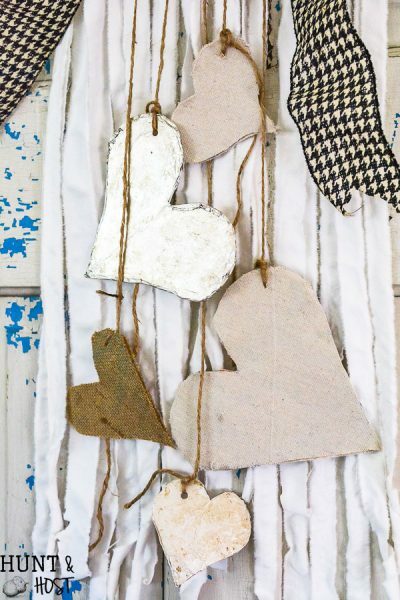 Love your quote: “getting your hands dirty can be a way to get your heart clean.”. Will follow up with your blog. Keep up the good work! Best wishes! Love how easy this sounds and it looks so impressive! I am amazed at the quality job way to go. I really like the carving decoration style… You’ve got me thinking : )) Maybe I should have to have one like you! Thank for sharing once again!